Cellucor P6 PM Review – Should you buy it? Can you build muscles while you sleep? Cellucor thinks you can. Cellucor is the product behind popular products like Super HD, C4 and M5 Extreme, and they have also released a sleep aid and testosterone booster combo with Cellucor P6 PM. 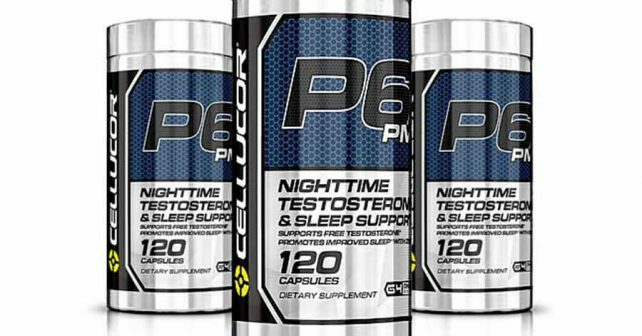 Cellucor P6 PM is the sleep aid variation of its other testosterone-boosting supplement, Cellucor P6 Extreme. In terms of formulation, there’s nothing much that differs Cellucor P6 PM from Cellucor P6 Extreme. There are other variations of the P6 line which includes P6 Red, and P6 Black, which are all testosterone boosters but with a slightly different variation from each. In this review, we’ll take a closer look at the P6 PM ingredients to determine if it has what it takes to be an effective testosterone booster. Testosterone is essential for developing the body’s lean muscle mass. Essentially, testosterone is an anabolic steroid naturally produced by the body, but synthetic variations tend to cause serious side effects. Cellucor P6 PM contains natural ingredients which support the body’s natural production of testosterone, which makes it safe to take compared to synthetic steroids. Who uses Cellucor P6 PM? Cellucor has a way of selling their products in stacks to make them more affordable for their consumers. You can expect loyal Cellucor customers to avail of a stack that includes Cellucor P6 PM. Other customers use P6 PM to help build muscle, as well as to improve their sleep quality. The main ingredient of Cellucor P6 PM is Tribulus Terrestris. Tribulus Terrestris is a highly-effective testosterone booster if taken within optimal doses. However, since the supplement fact sheet of Cellucor P6 PM does not contain the exact dose, it would be difficult to determine if Cellucor P6 PM contains the right amount of Tribulus Terrestris to actually contribute to muscle mass development. Cellucor P6 PM also contains Zinc, which is the primary ingredient needed for the natural development of testosterone. Zinc is acquired by the body through our regular diet, and is rich in foods like oyster. If zinc levels are down, you can expect your testosterone levels to go down as well. Cellucor P6 PM contains 30mg of Zinc, which is double the %DV in a man’s diet. However, Zinc can only be effective if the user actually has a deficiency of zinc. Otherwise, it wouldn’t be as effective as described in the product. Cellucor P6 PM’s blend contains a mix of L-Theanine and Passion flower to promote a calming effect that helps during relaxation, and Melatonin to promote better sleep quality. When it comes to testosterone-boosting supplements, checking the ingredients are important. Stick to what works. Xtreme Testosterone contains Tongkat Ali which promotes the production of testosterone, and prevents the conversion of testosterone to estrogen. Only invest on the right products. If you’re serious about gaining muscle mass, take Xtreme Testosterone.